We love to work with destination brides and grooms who love travel and seek adventure! Instead of staying at their ceremony or reception venue, this couple wanted to enjoy the city they chose for their wedding destination. After they said their vows and toasted their guests, we headed out for a two-hour exploration of Old San Juan in search of fun and great photos! 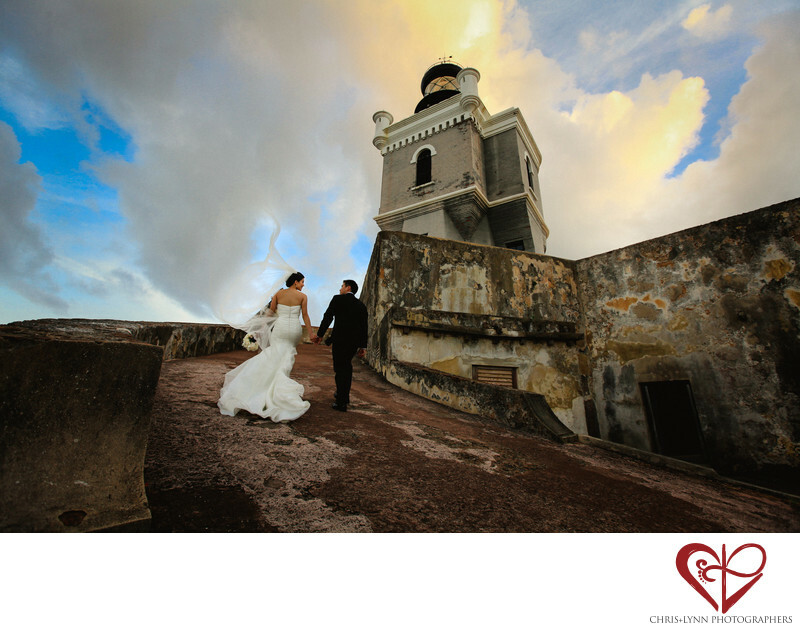 The traditional photo of a the bride and groom away walking hand and hand was made more dramatic by the cloudy skies, a blowing veil, and the lighthouse tower of the historical fort. The composition of this image includes the curved textured roadway to lead the eye to the couple and a large expanse of sky to emphasize the vastness of the scene. Instead of asking couples to mimic artificial poses, we prefer to have them interact in an unforced manner. For this image, we simply asked the bride and groom to talk about their favorite moments during the ceremony as they walked up the towards the lighthouse. When couples look back at their wedding photos, we want them to remember a real moment, not an awkward pose their photographers instructed them to copy! The result is an environmental wedding portrait that is beautiful and natural. Location: Castillo San Felipe del Morro, 501 Calle Norzagaray, San Juan, 00901, Puerto Rico. 1/320; f/5.0; ISO 400; 16.0 mm.